What do you get when you combine the battle gear of an antiquated, old-world crusader with a modern weapon of wrath? 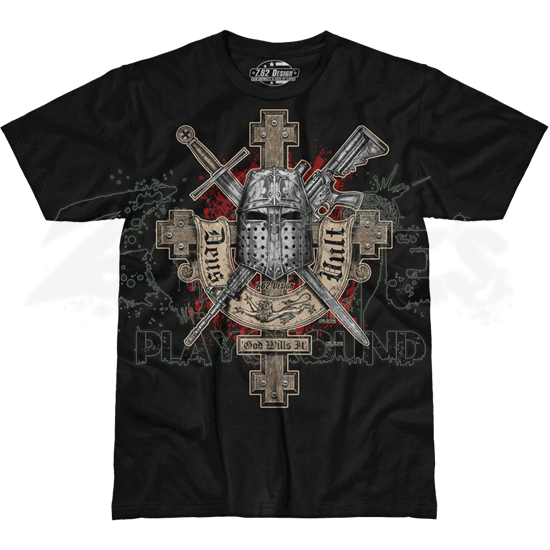 The Deus Vult Premium T-Shirt displays an eye-catching religious warrior graphic on its front. This military t-shirt displays a classic crusader cross draped with a banner that features a heraldic lion and the words DEUS VULT. This Latin phrase means, God Wills It. Centered over the cross is a detailed crusader helmet in front of a crossed crusader sword and modern rifle of a soldier. This comfortable patriotic shirt is made from 4.5 oz. ringspun cotton, ensuring that it is a great pick for casual wear. The Deus Vult shirt makes a fantastic piece of military apparel for all who want to show respect for warriors past and present.